Adding one more species to the rich flora of Western Ghats- a world heritage site and one of the eight hottest biodiversity hot-spots in the world- researchers have identified and described a new herb from its southern parts. According to a recent research paper published in the International journal Rheedea from Indian Association for Angiosperm Taxonomy, the plant was named Henckelia pradeepiana, to honour Dr. A K Pradeep, curator at the Calicut University Herbarium who first collected the specimen in 1997. 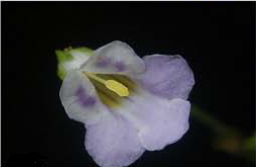 Spotted from parts of Vellari Mala, a hill tract in Southern Western Ghats, situated in the Calicut district of Kerala, the single leaved plant belongs to Gesneriaceae family of perennial flowering plants. 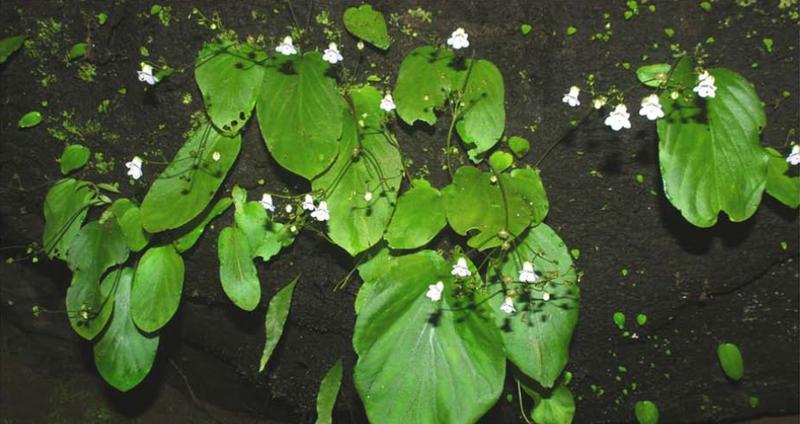 The new plant was actually located on damp rocks near the Olichuchattam waterfall in Vellari mala in Southern Western Ghats in 1997 by Dr A K Pradeep Kuamr during a botanical survey. However, he was not able to describe the plant since it remained elusive for a long time since then. According to the researchers, recurring landslides and resulting change in the water course could have kept this plant elusive, despite repeated attempts to locate it again. However, K M Manudev, at the Plant systematics and Floristics Lab, Department of Botany, St Joseph’s college, Devagiri in Calicut, who is the part of the present study team, has located the plant again in 2010, after 13 years from the first report. While the first spot from which Dr. Pradeep reported the was at an altitude of 1160 meters from the sea level , the new record came from a few kilometers down at an altitude of 460 meters, from Muthappanpuzha. The plant is found firmly attached to moist rocks along stream sides, or on tree barks in shady, humid areas, usually growing associated with mosses and ferns at elevations between 460 meters to 1160 meters from the sea level in Western Ghats. According to reports, the plant usually has a single broadly ovate or oblong leave and in rare cases, up to 4 leaves. 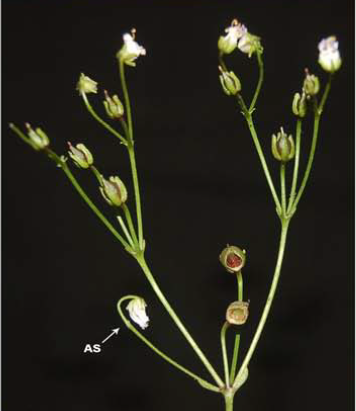 The flowers on the plant are arranged in cyme or in flat topped cluster in which the central or terminal one opens first. The flower clusters are found to have to 1 to 20 flowers on the plant. The bright yellow stigma of the flowers with strongly expanded lower lip is a remarkable characteristic of the plant. The usual flowering and fruiting season of the plants occur during July to October. According to the research paper, close relatives of the plant found in South India and Sri Lanka have unique tuber like features. However, Henckelia pradeepiana differs from them with its uniquely shaped, flat discoidal tuber and ovoid, globose thick fruit. Similarly, the faint blue flowers of the plant are also typical to its relatives in the peninsular India. Though the plant which was hitherto unknown to science has been described and christened as per taxonomic norms, not much is known about the details of the ecology of the plant and the ecological services rendered by it. The present reports restricts its distribution to southern Western Ghats of Kerala, however, it is highly likely that the plant can be found in other parts of Western Ghats at similar elevations. 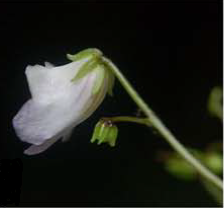 The closest relative of the plant, H. missionis, however is reported from Western Ghats from Kanyakumari district in Tamil Nadu which is 400 odd kilometers away from the present record of the new species. A. Weber of Department of Structural and Functional Botany, Faculty of Biodiversity, University of Vienna and Santhosh Nampy with the Plant systematics and Floristics Lab, Department of Botany, St Joseph’s college, Devagiri in Calicut has also co-authored the paper. The new addition also points out that floral richness of this biodiversity hotspot still needs more exploration. This is great work in finding such a new species & publishing it on this blog. We just let the common public( those who read our humble blog) about the new findings made by scientists and nature lovers about the hidden treasures of mother nature which we should conserve. the actual work is done by them who work months and years to unravel nature mysteries. so all the credit goes to them.